Just as there are viewers who prefer Chantal Akerman’s Golden Eighties (1983), her feature-length “preview” to her 1986 musical Window Shopping, and others who prefer Jean-Luc Godard’s 54-minute Scenario du Film “Passion” (1982) to his 88-minute Passion (made the same year), it’s entirely possible to prefer Guerín’s 67-minute “sketch” to his 84-minute feature. In some ways, I do myself--as does another critic, Linda Ehrlich, writing for the online Senses of Cinema, and for what I take to be similar reasons: the fact that Some Photos, with its very musical strategies for editing still photographs to simulate motion and play with our sense of duration, arguably leaves more creative space for our imaginations. But this comparison tends to overlook the degree to which that there’s an ongoing dialogue between these films about their separate playing fields, which don’t even define “play” in the same fashion. But one can also argue that these films are playing quite different games with different rules.In Some Photos, Guerín ‘s first visit to Strasbourg was prompted by a literary pilgrimage relating to Goethe, and later in that film, he travels to other cities on other romantic literary quests as pretexts for his (and our) girl-watching — heading for Florence to “track” Dante’s Beatrice, and then going elsewhere after Plutarch’s Laura. In the City of Sylvia lacks this back story and these pretexts, for our imaginative wanderings and for Guerín‘s. 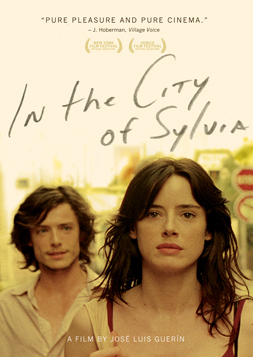 If the first film’s agendas are more open-ended and abstract, this is partly because they preclude any actual human encounter — and a very awkward and protracted human encounter of cross-purposes and even harassment occupies the middle section of In the City of Sylvia, implicating us as well as the hero. Furthermore, the formal differences between black and white still photographs and silence in Some Photos and color, sound, and motion in In the City of Sylvia are too important to be regarded as incidental. The two films even have separate models in separate media: W.G. Sebald’s illustrated 1990 novel Vertigo, with its own lone literary pilgrimages and black and white illustrations, appears to be an overt reference for Some Photos, and Alfred Hitchcock’s languorous 1958 thriller of the same name seems no less pivotal for its sequel (though it also gets cross-referenced in Some Photos — along with Hitchcock’s Psycho via “the Bates Motel”).